Somehow, it keeps managing another ten minutes out of you. eveloper Tritium subscribes to the ethos of fun through strong design. Casual strategy-puzzler Dragonester occupies a player's first ten minutes by first baffling and then underwhelming him, but this only verifies that a) Tritium is Korean, transliteration being a rare art; and b) the game's cumulative mechanics describe play so formidable they must be introduced slowly. 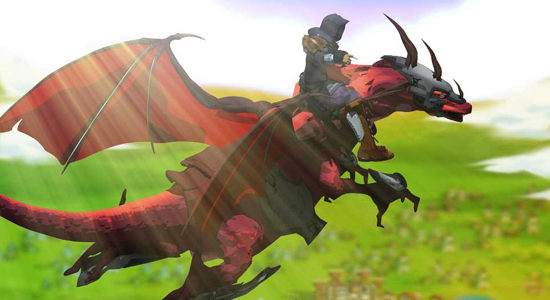 Dragonester looks cheap and dated, stretching painfully across a widescreen monitor; its PC destination anyone's guess. But then it manages another ten minutes out of you. Tritium cradles the game in lore that recites Dragonriders of Pern verbatim. Men raise and ride winged serpents, immemorial and sempiternal in concert. An economy sprung from the nursing of dragon's eggs serves to defend the kingdom from invaders, but also to conciliate between the beasts' rival flights themselves. Clucky reign: an economy sprung from the nursing of dragon's eggs serves to defend the kingdom from invaders.Such a tableau narrative — neither particularly original nor particularly necessary — justifies inclusion by colorfully explaining each new elaboration of gameplay. Work begins almost vapidly — players watch over a few wood-framed nests in which expectant dragons lay eggs to be stored in a warehouse, then piled into a wagon and sold at market. Period. Progressing stage by stage, however, reveals more desirable eggs (larger specimens command more gold); ways in which to obtain them (erect jumbo nests and attract dragons to match, or combining two small eggs in a hatchery); and how to increase their value (combine them with gems in a centrifuge). Timed stages reward players for completing objectives quickly — interesting, but also subtly mandatory, as later stages require players to make purchases from the gold they've earned. Great ideas — in moderation: some stages indulge in repetition and quickly cloy.And there are multiplying ways by which disaster can visit the village nursery. Dragons strain the man-made nests, so proceeds must be used to repair them before they collapse. Dragons also — being animals, after all — carry enmities for one other, flying off in a huff and demolishing a nest when their neighbor's scales are the wrong color. Strange, bulbous flying creatures squat in nests, while spiteful black dragons swoop down and torch the things. All put together, these threats have players madly clicking and dragging — mostly dizzying fun, though a few shoot-'em-up stages indulge in repetition and quickly cloy. And the pervasive low-budget feel makes even a reasonably rich game with evident replay value difficult to widely recommend. Some of Tritium's cultural muddling comes through in preserving the contrast of fantasy musical fare to a stage-end jingle crossing game-show leitmotif with the theme to Hawaii Five-0. In a market conquered by PopCap and Telltale, Dragonester really isn't a title meant for the PC but mobile devices; so if and when Tritium tacks to the iPhone, it might have itself an airport-concourse hit. i had never heard of this game and now i am excessively interested in it. i read Dragonriders of Pern, until i realized it was a girl book....... yesiboughttheannemccaffreyartbook! okay! geez. what can i say, i love dragons and dragon related fantasy art. That's okay, Timm — when I was in grade school I enjoyed The Hero and the Crown, another arguable "girl book." Good fantasy fare, all the same. My caveats stand: the Pern references are well-used but superficial, Engrish is heavy, and the cheapness may hit some players harder than others. That said, I had fun. What's the story behind the big-nosed Muppet lookalike? Ed: he's a magistrate of sorts who incorporates each narrative element into the next stage — e.g., hostilities break out between red and blue dragons, so the magistrate warns in his roundabout way that nests occupied by opposing types can't be adjacent. As for the appearance: my guess would be anime origins. You might be able to infer more. Perhaps you're right, Mike. He is a tad "Miyazaki-esque."